White chocolate dipped strawberries with bacon bits? I took this picture on Feb 2. First, it seemed a bit early for Valentine's Day. Second, I can't imagine who thought this was a good idea. White chocolate is an oxymoron. Keep that gross artificial abomination away from my naturally amazing strawberries. And I can't think of a worse combination than strawberry, bacon, and white chocolate. Years ago I picked up some [not white] chocolate covered bacon strips from Central Market and it was surprisingly good. But I have to say, nothing about your photo there looks appetizing. 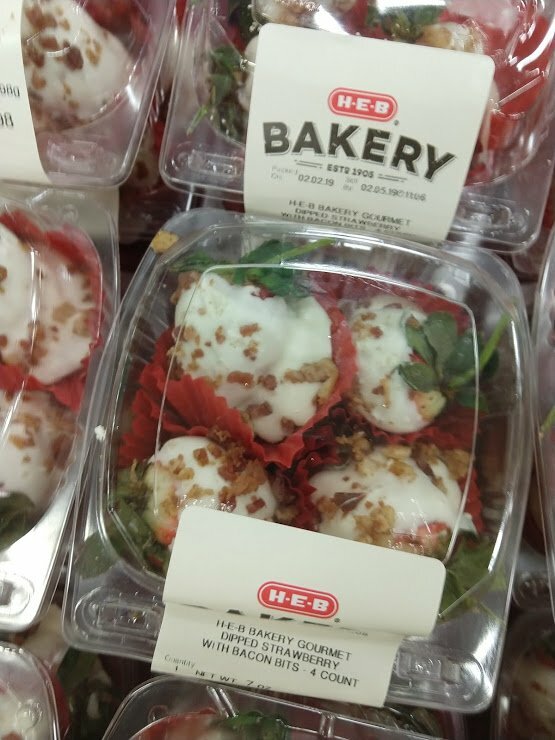 HEB is reaching too much on that one. chocolate covered bacon is amazing. chocolate covered strawberries are amazing. chocolate covered strawberries sprinkled with bacon bits might also be amazing. I've never tried it, but I can easily imagine it. And that's why I think this happened: they were doing chocolate and white chocolate dipped strawberries for Valentine's Day. And bacon goes well with chocolate, so they did that. But then somehow someone screwed up and decided to also put the bacon on the white chocolate. I have to think no one intended this level of insanity. That would make sense. Somebody screwed up and they decided to try selling it anyway rather than throw it all away. But bacon and white chocolate sounds like a terrible combination.